While year-round mild temperatures here in the Sunshine State allow runners and other athletes to pursue their favorite sport every month of the year, there’s a common foot issue that can sideline athletes—plantar fasciitis. This condition affects the bottom of the foot (from behind the toes all the way to the heel and usually through the arch area), and it’s where the plantar fascia has gotten inflamed. You may be wondering if you have plantar fasciitis or another type of foot pain. With plantar fasciitis, you typically will wake up with tightness in your foot. When you take a step, it feels like a tight band in the foot. If you sit for an extended period such as for work and stand up, you likely will have that bothersome pain then as well. We’ve gotten tremendous results with our class IV deep tissue laser that helps those tissues to heal. With laser therapy, you not only can get out of pain but you also can heal and rehabilitate very quickly. 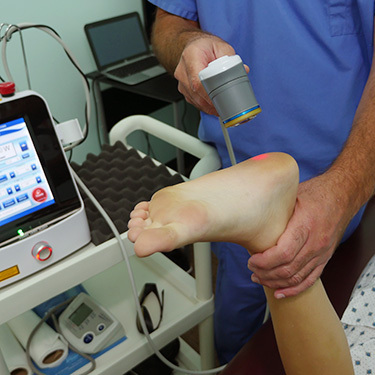 The laser is used directly on the bottom of the foot. Treatment takes just 5-10 minutes, and it gets excellent results. If you’ve never experienced laser therapy before, it’s pain-free, and you will feel a sense of warmth on the foot. The light will penetrate through the skin and go down into the tissues, helping you heal so you can get out of pain. Within 5-10 visits you should experience some relief or become totally pain-free. You can get your first laser therapy treatment during your initial visit to the practice. Another therapy we use for addressing plantar fasciitis is Kinesio Taping which promotes healing. By taping the foot, we can take pressure off of it so you can still walk around and not inflame it. If you are suffering from foot pain or plantar fasciitis and haven’t found the answers you need, we want to help at CHIRO & LASER Pain Relief Center of St. Augustine!